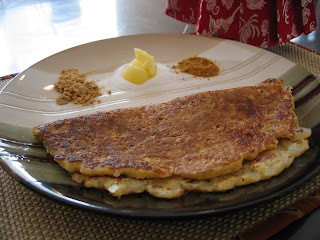 Adai - one of our favourite dishes. We made it for dinner last nite. As it does not need much soaking, this is a quick dish to make. It is also protein rich - as it contains a lot of dals. I don't know if ginger, chilies & curry leaves are used in the traditional recipe. This is how I make it. Soak rice in warm water for 1 hr. Mix all the dals & soak in warm water for 1 hr. Soak pepper, jeera & red chili together in a little warm water (just enough to cover) for 1 hr. Mince ginger & curry leaves. Chop onion - not too fine. Put ginger, curry leaves, soaked pepper, jeera, red chili (along with the water) into a mixer, add some rice & dal and grind till it is coarse. Grind the rest of the dal & rice to a coarse batter. Add salt as needed. Add the chopped onion & hing to the batter. Mix well. Heat a griddle (tava), put a ladleful of the batter in the middle & spread in a circle. Put a few drops of oil on the sides. Cook for 1 minute. Turn and cook other side for 1 minute. Serve with jaggery, sugar & ghee or molagai podi. The adai is quite thick, so takes a while to cook, make sure that the griddle / tava doesn't get too hot. It is important to put the pepper / red chili / ginger / curry leaves mix at the bottom of the mixer. This will make sure that they grind well. If not, there'll be whole peppers in the adai & that takes away the taste. Sending this along to Latha at Masala Magic for WBB-Combi-Breakfast event. Vengaya Adai wow something new and looks gr8. First time here. U have a nice blog. I like that spiced buttermilk also. I added u r blog in the food blog hub. thank you! and thank you for including me in the food blog hub.